Home▸Cleanrooms▸Learning Center▸What is a Clean Room? With an increasing emphasis on maximizing product yield, improving quality control and ensuring safety, companies throughout many industries are looking to install cleanrooms or controlled environments in their facilities. No longer are cleanrooms limited to high tech semiconductor manufacturing or university research labs. Today, cleanrooms are being used in all types of environments. But what exactly is a cleanroom? Historically, a cleanroom was defined as an enclosed area within a manufacturing or research facility that was specially designed to control air pollutant levels as well as pressurization, temperature, humidity and personnel access to meet the critical environmental conditions demanded. Cleanrooms were traditionally utilized by a variety of industries and research facilities -- including pharmaceuticals, biotechnology, life sciences, microelectronics and food packaging -- to protect products or processes from contamination. Contaminants included dust, vapors and microbes as well as particles generated by people like skin flakes, hair and clothing fibers or other materials like paper, pencils, paint and coatings. Essentially, all contaminants needed to be controlled to ensure product quality, worker safety or the integrity of research. To certify that cleanrooms were designed properly, a set of standards were developed to classify the ability of a particular cleanroom design to minimize contaminants. True "cleanrooms" must meet guidelines for the amount and size of particles in a specified volume of air. Of course, cleanrooms also benefitted companies by helping them minimize quality problems and increase product yield...something that even manufacturing, laboratory and other facility managers desired. These users typically want to control an environment, but do not necessarily need to comply with specific Cleanroom Classification Standards. For those companies that need to adhere to specific cleanroom standards, they must understand that cleanrooms can be built and operated to meet different cleanliness classifications, depending on the environmental conditions required for their use. The primary authority for cleanroom classifications is the International Organization for Standardization or ISO. ISO 14644 classifies a cleanroom based on the size and number of airborne particles per cubic meter of air. Prior to the implementation of ISO 14644, Federal Standard 209E set the industry guidelines for cleanroom classification. Both standards are displayed in the table at right. In the cleanroom environment, air particles are measured in microns or micrometers. (One micron equals one-millionth of a meter.) Micron-sized particles are smaller than a living cell and can be seen only with the most powerful microscopes. 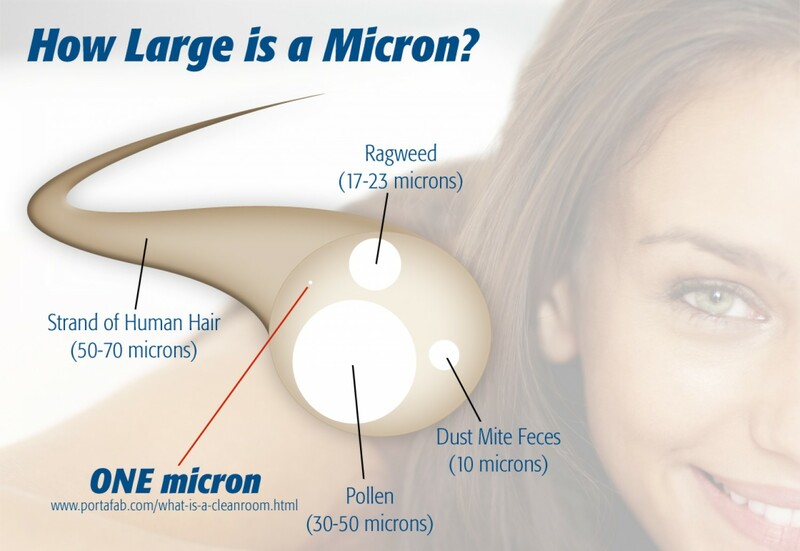 To put this in perspective, a strand of human hair can vary in width from approximately 20 to 180 microns, while the average size is typically 50-70 microns (as in the drawing at right). One small dust particle seen in a ray of sun equates to approximately 60 microns. The human eye cannot consistently see objects less than 50 microns in size. Pollen is approximately 30-50 microns. Bacteria are approximately 2 to 10 microns in size. A typical indoor air sample may contain anywhere from 500,000 to 1 million particles per cubic foot of air. By comparison, an ISO class 5 cleanroom is designed to allow no more than 3,520 particles equal to or larger than 0.5 microns per cubic meter of air. This equates to a Class 100 cleanroom under the Federal Standard 209E, which allows for 100 particles (0.5 microns or larger) per cubic foot of air. To achieve the required environmental conditions, the air in a cleanroom is purified using High Efficiency Particulate Air (HEPA) filters. Air is forced through the filters, which remove particles as small as 0.5 microns. The filtration system depends upon the required level of cleanliness. Single pass systems are commonly used in environments that do not require temperature and humidity control. 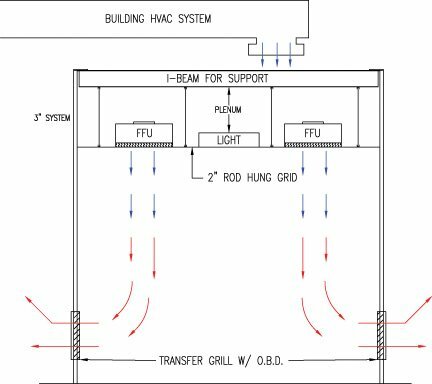 In "recirculating" air systems, air handling units condition the air, which is drawn through low wall returns and into the ceiling plenum. 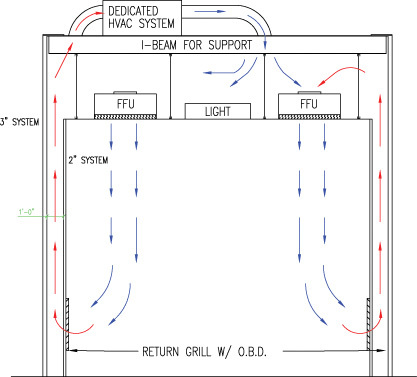 These designs are typically used for cleanrooms with temperature or humidity requirements, and to isolate the environment for greater process control. Today, the word "cleanroom" has essentially been extended to define any area in which environmental controls are applied. Many operations will build "cleanroom-like" areas in their facilities that essentially reduce contaminants and control an environment, but do not necessarily need to meet any ISO standards. Given this, industry terminology is gravitating towards the use of the term "Controlled Environments" for areas in which contaminants, temperature, pressure, static, humidity or other elements are controlled even if adherence to a cleanroom standard is not required. Regardless of whether you need to build an ISO 3 cleanroom for a nano-technology research lab or just want to protect critical equipment or processes, PortaFab has three modular cleanroom systems, numerous interchangeable components, and a nationwide network of cleanroom contractors to help you with any of your cleanroom construction needs.